Dental implants are a revolutionary option to replace missing teeth. This treatment has proven to be one of the more advanced procedures in modern dentistry. A dental implant can fill the gap where a tooth was once rooted, providing results that look, feel, and function like a natural tooth. Unlike dentures, which are typically associated with slippage and discomfort, dental implants are designed to become stable, permanent fixtures in the mouth. They also require no special maintenance outside of daily dental hygiene and regular cleanings. Our implant dentist, Dr. Michael Fulbright, offers full dental implant procedures to help patients successfully replace missing teeth and feel great about the appearance of their smile. The sections below will provide you with a detailed picture of what you can expect from dental implants. If you would like more information, or if you would like to schedule a consultation here at Fulbright Cosmetic & Reconstructive Dentistry, please contact our office. One of the main benefits of implant dentistry over other tooth replacement options is that they prevent the sunken look that is associated with missing teeth. Because the implants are placed in the jawbone, they help retain the fullness and contours of the face by retaining the supporting bone, much like a natural tooth root. In addition, dental implants look and function much more like natural teeth when compared with other types of replacement options. Unlike dental bridges, which depend on surrounding teeth for support, dental implants stand alone without affecting other teeth. Dental implants do not move or slip along the gumline, and they require no extra maintenance aside from regular brushing and flossing. We can place one implant to replace a single missing tooth, or several dental implants to replace multiple teeth. In addition, we can use dental implants to stabilize a dental bridge or partial denture, as well as full sets of dentures, with our implant supported dentures procedure. We will begin the tooth replacement process with an implant dentistry consultation. 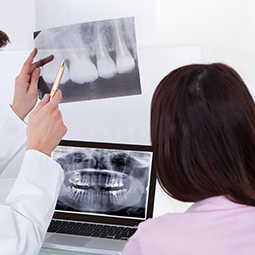 Dr. Fulbright will examine your jaw and gums to determine if dental implants could be beneficial for you. If your jawbone has an adequate foundation for the titanium posts that will be anchored to it, you might be a good candidate for this procedure. Age is not a barrier to implant dentistry; in fact, people of all ages are choosing dental implants for tooth replacement. To learn more about candidacy requirements for dental implants, please view our dental implant candidates page. A single missing tooth can cause an array of problems. These include its effect on proper speaking and chewing, as well as its potential for bone degradation. A dental implant can replace a single missing tooth with results that improve both the function of your teeth and the appearance of your smile. If you are missing multiple teeth directly next to each other, an implant bridge may be an ideal option, particularly if you are prone to grinding or clenching your teeth. An implant-supported bridge is somewhat like a traditional dental bridge; however, instead of the bridge being primarily supported by adjacent natural teeth, it is reliant on dental implants. This type of missing teeth restoration can be beneficial for patients who may not have enough bone density in the exact area of the missing teeth, but have adequate density in areas surrounding it. It essentially serves as a bridge with dental implants on each side of the missing teeth and crowns in-between. Implant supported dentures can be a good option for patients who have multiple sets of missing teeth and those who are missing entire rows of teeth on the upper and/or lower arches. 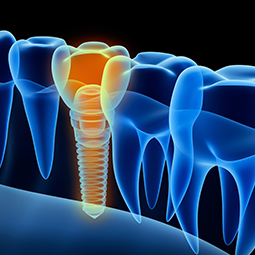 Dental implants ultimately offer more stabilization and strength to dental bridges and dentures. Implant supported dentures eliminate the need for messy adhesives and work to prevent dentures from moving or slipping out of place. This can make the dentures feel and act more like natural teeth. To achieve the best possible results from dental implants, the planning for the procedure must be extraordinarily precise. Guided implant surgery is a way to achieve this. Dr. Fulbright utilizes state-of-the-art computer technology to take a 3-D image of your mouth. This image shows him intricate details of your teeth, gums, and bone structure. With such a detailed image, Dr. Fulbright can plan the placement of your implants with incredible accuracy, less risks, and more predictable results. The guided implant surgery technology ultimately works to ensure the most comfortable and natural fit and appearance for your dental implants. If you are a good candidate for dental implants, we will schedule you for the surgical procedure to have the titanium implant placed in the jawbone. The advanced technology and use of local anesthesia can help to make the dental implant procedure as comfortable as possible for patients. If you would like additional assurance that you will experience a relaxed and comfortable procedure, we offer a range of advanced sedation dentistry options. The implants will be carefully and precisely placed in the area of the missing teeth to allow for the most comfortable, functional, and natural-looking result. Once the posts have been placed, the success of implant dentistry depends on the body’s ability to heal. 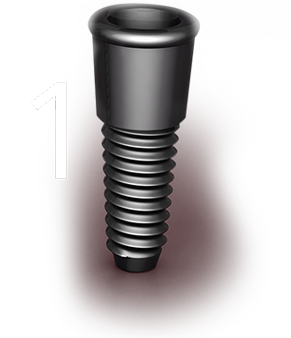 During a three to six month healing period following the implantation procedure, the jawbone should fuse to the titanium implant (this process is called osseointegration), forming a strong foundation for the replacement tooth. At this point, you will visit Dr. Michael Fulbright’s office so that the natural-looking artificial tooth can be attached to the implant post. Although the implant posts typically last a lifetime, the replacement teeth can become worn or damaged over time. Our dentists can remove old replacement teeth and replace them with new, natural-looking restorations. A titanium implant is placed where the tooth has been lost. After the implant has healed, it is uncovered and the post is placed on the implant. A ceramic crown is placed on the post, replacing the tooth. The cost of a dental implant procedure will vary based on your individual needs. It is estimated that the average procedure can generally range from $3,000 to $4,500, but your procedure may fall above, below, or in-between that range. Some factors that help determine the overall cost will likely include the education and experience of the dentist, the number of implants you will need, and the materials the dentist uses to complete the procedure. In some cases, insurance may offer coverage for dental implants. We offer unique dental financing options at our office and accept all major credit cards as payment. Dental implants have been used for more than 30 years and have been proven as an effective and safe procedure for many patients when performed by an experienced implant dentist, particularly an American Academy of Implant Dentistry credentialed dentist such as Dr. Fulbright. 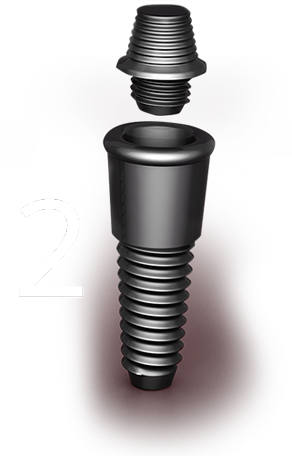 The titanium posts are made of a biocompatible material and the bone should fuse around the implant, providing stability and strength. The dental implants that we place are designed to offer long-lasting benefits. If good overall dental health is maintained and you regularly receive quality dental care, your dental implants should last for decades. If you are not a candidate for dental implants, or if you would like to replace missing teeth without utilizing a dental implant for each tooth, there are a number of advanced alternatives available that offer effective results. Our practice provides a full range of options, including implant dentures, bridges, and other treatments. In some cases, patients may need what’s called a sinus lift (or sinus augmentation) in addition to a dental implant procedure to attain the best results. Sinus lift has made it possible for patients who have inadequate bone density in the upper back jaw – a condition that may have disqualified them as candidates for dental implants – to now be eligible for the procedure. The treatment basically takes a small piece of existing bone in the sinus cavity and elevates it to provide better bone density to accommodate an implant. A bone graft will then be placed underneath it to fill the space. Ultimately, sinus lift procedures give the implant a more solid support structure and a better chance of successful fusion to the bone, thereby increasing the probability that the implant will become a strong and permanent part of the mouth, similar to a natural tooth. Bone grafts are often very helpful to enhance the strength of the existing jawbone in the area of missing teeth for greater density. Once the grafts have fused to the bone, it can better accommodate a dental implant and increase the chances that dental implant results are successful and permanent. Ridge maintenance grafts, also known as ridge augmentation, can be beneficial for patients who suffer from jawbone recession after tooth loss. In some cases, people who have had dental implants experience indentations along the gums and jawbone where the implants have been placed. This sometimes happens in patients who have had severe gum disease. These indentations can be very difficult to clean with regular brushing and flossing, and can give off an unnatural appearance. Ridge augmentation can fill in these areas using a bone graft or other techniques, ultimately providing a more symmetrical and balanced appearance between the gums and the implants. If you would like more information on dental implants, or if you would like to schedule a consultation with one of our experienced dentists, please contact the office of Dr. Michael Fulbright today.